The Circle in the Square theatre provides an intimate setting. I felt that I was in an almost voyeuristic space observing the events and dialogue between the characters: The Man, The Woman and The Other Woman. 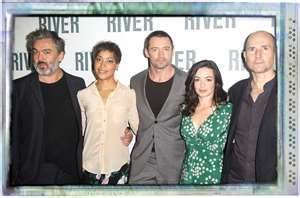 It’s their first weekend away and The Man, played by Hugh Jackman, has brought his new love to his special place, the cottage by The River, to fly-fish for sea trout. The Woman, played by Cush Jumbo, would prefer not to be fishing but she’s humoring her new boyfriend. The Other Woman, played by Laura Donnelly, comes in and out of the story. Who is she? A former lover? A ghost? They catch a fish and Hugh deftly guts the fish, preps, and cooks it along with vegetables. There was one performance where Hugh cut his thumb and proceeded to bleed throughout the show. Beware the sharp knife. I can’t tell you much more about the story, as that would give away the secrets. But, I will tell you I thought about this play for many days/weeks since seeing it. What are we looking for in our relationships? Is our first love the one that we hunger for? Is this what the man is searching for? Who is our first love? Is it our parents? Sibling? Girlfriend/Boyfriend?? Or, are we in love with a time, that perfect weekend? When our uncle took us fishing for the first time? First date, first kiss, first weekend away. In those early stages of a relationship what is it that we are searching for? Is it intimacy? Connection? Understanding? Acceptance? Or? What’s the one question that we should never ask a partner? In my opinion it’s ‘How many girlfriends have you had?’ This play was a reminder to me never to allow myself to think of any others. But The Woman can’t stop herself. It gave me goose bumps. There was this constraint in the performances: I kept thinking on the first weekend away it’s about ‘passion’ and having ‘chemistry’ with the new love, but of course we are always sussing the other one out and that can hold us back. There is only one kiss in this show but there was no passion there. Was that directorial or was it in the script? Or, was it Hugh who wanted to hold back here? Is it the man having doubts about The Woman? Get your tickets soon as this is a small theatre and it’s only running until early February. But, before you go read this hilarious message from Time Out about ‘What Not to Do at a Hugh Jackman play’.